Seahorse Charters, Islamorada Is Our Catch Of The Day! 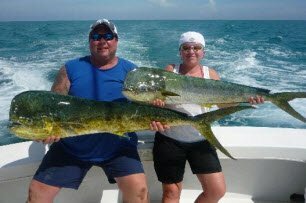 If you want a great day out fishing then Seahorse Charters based in Islamorada will certainly tick all your boxes. Firstly when you go deep sea fishing in the waters around the Florida Keys you want experience of the waters and a deep knowledge of where the fish will be. What’s the point of taking your rods, packing your beers and then just floating around aimlessly whilst the fish are a couple of miles away? Answer no point at all. You will have Captain Rick and Mate Erick who have worked the waters for 27 years, and a boat that may not have the kind of “non required luxury” of other charters, but does have great fuel efficiency and maximum fishing space. Fuel efficiency may not be the first thing that you think about when you set off on a fishing adventure, but if you are chartering a heavy boat full of things that you won’t be using then that’s up to you. We would certainly recommend the light approach to both vessel and cost. Captain Rick Rodriguez and the mate Eric are a great team. You can see from the moment you set off what fishing in the Florida Keys is all about. Enjoyment of the catch, and a love of the water and these two guys have both in abundance. They work as one to make sure that your day is a success by floating you right on top of the fish. As soon as they leave the dock, its full steam ahead to get you in the perfect position to drop your line and catch as many fish as possible. All the while they crack jokes, keep your entertained and love every minute of the jobs. When we went out with them we had a couple of kids with us, who although excited at the beginning, felt a bit sick as the day progressed. Capt Rick and Eric made sure that they kept the children’s minds away from the “potential queasiness” by really getting them involved, talking to them, and telling a lot of pretty poor jokes. So what fish will you be catching on your day out with Seahorse Charters? Well this depends purely on the season, but Mahi, Sailfish, Marlin, Tuna, Wahoo, Hogfish, Amberjack, Yellowtail, Sharks, and other fish are caught all year, only the technique changes with the season. As will the rods, as both light and heavy tackle is used depending on the season to match sure that you have something to eat in the evening. Another thing that is great about Seahorse Charters is how both gentlemen are so focused on conservation, so any catches that are not going to be eaten will be thrown back into the Florida Keys Waters. Good sense, good price and a great days deep sea fishing Florida Keys style.